Sunday afternoon. A great time to take a look at your rides. Check the oil. Change a tire. Apply some wax. All good stuff until a chunk of ice screaming down out of the sky breaks up the party. 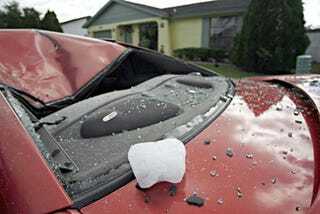 A five-pound ice cube recently chose Andres Javage's 2000 Ford Mustang as its target, and hit with such tremendous force that it collapsed the roof, blew out the rear window, and caused the car to jump three feet into the air. An incredulous neighbor came over and took the big chunk into the freezer. The FAA is looking into if the chunk came from an airplane. While noted authorities and geniuses are pretty sure where blocks of blue ice falling from the sky come from, they are less lucid when it comes to origins of clear ice descending from the heavens. Position Number D&apos;oh! In Russia, YOU Support Bridge!